I don’t know about you but everytime I turn on a baking show at the moment they seem to be making a croquembouche! I don’t believe I have ever had one, however, and to be honest with you, everyone I have spoken to recently haven’t had one either! I blame The Great Britsh Bake Off! The contestants on the show are supposed to be amateur bakers but the skills they are expected to have are way beyond the normal cook! 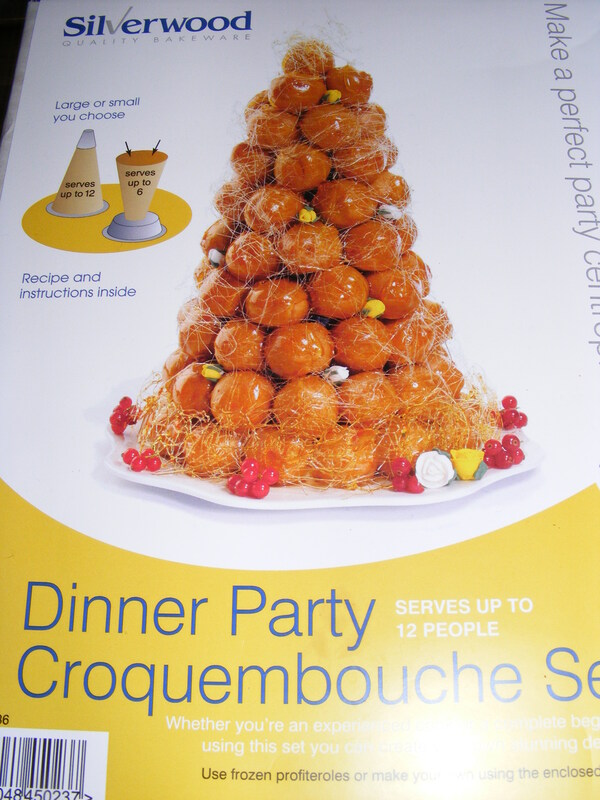 I bought this croquebouche set because I have a sneaky feeling that I will start getting orders for croquembouches as wedding cakes soon. It happened with cupcakes, then whoopie cakes, then macaroons, then cake pops so I’m am expecting a croquembouch onslaught shortly! I have quite a few Silverwood products and can honestly say I have never had a problem with them. My adjustable cake tin is fantastic so I had high hopes for this set. It wasn’t quite what I was expecting, however. 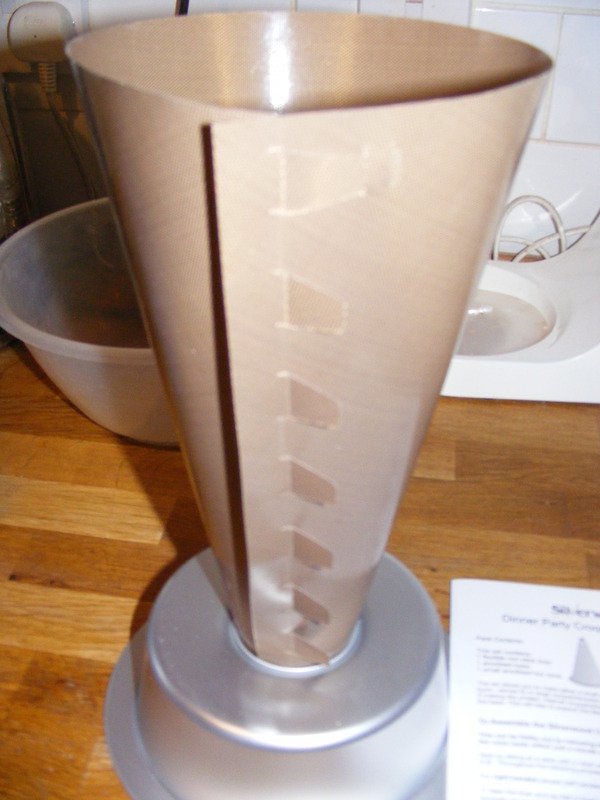 I had visions of a big metal funnel because the ebay picture was not very clear and the description simply said a croquembouche set. That is not how it came however. The set consits of a base, cap and flexible non-stick sheet that you wrap around into a cone shape. “That’s clever!” I thought and it is but in fairness it is a bit fiddly. Firstly you need to make the cone shape. 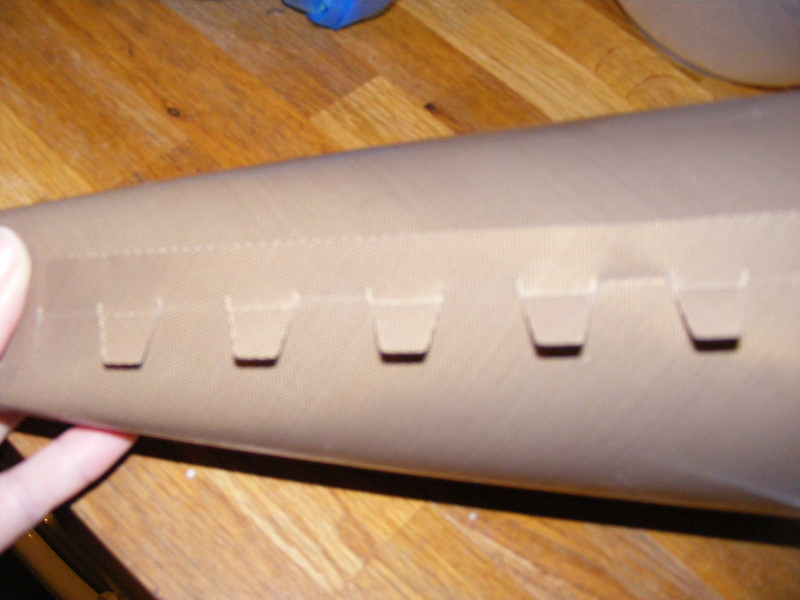 The sheet has a tab and slot setup but because the nonstick material is slippy the cone does not hold its shape very well. I followed the instructiosn to the letter but since they are written instructions and I am clearly a visual learner I did find them quite difficult to follow (and I’m not stupid! I have a PhD in muscle physiology!). Eventually I resorted to using old Faithful and slapped some sellotape along the seem. Although I have made Choux pastry in the past (my Nan has a thing for Chocolate Eclairs!) I promised myself that I would stick religiously to the method provided. I have to say when I read the recipe I had my doubts. 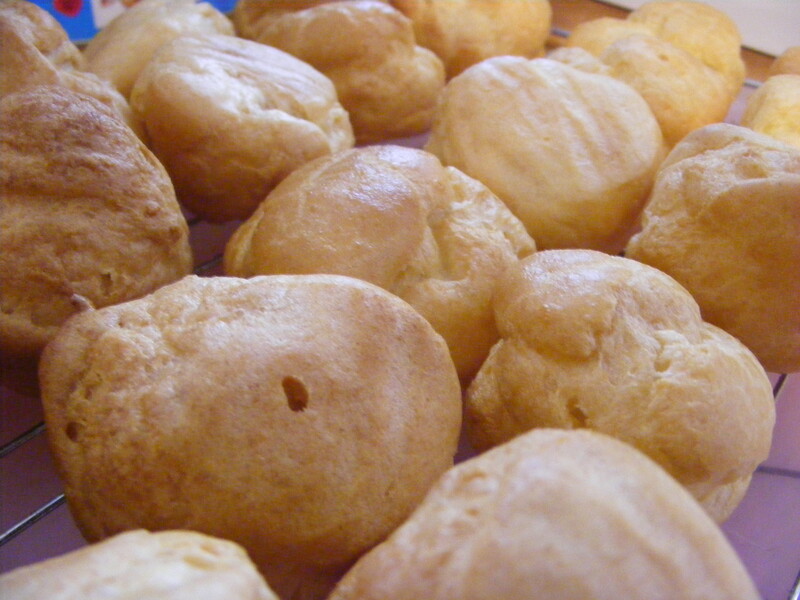 I was taught that to make proper Choux you made a Roux then beat in the eggs until the “furry saucepan” stage and so on. This method was so diffierent that I really saw this as an exercise in futility but I am glad to say I was wrong. 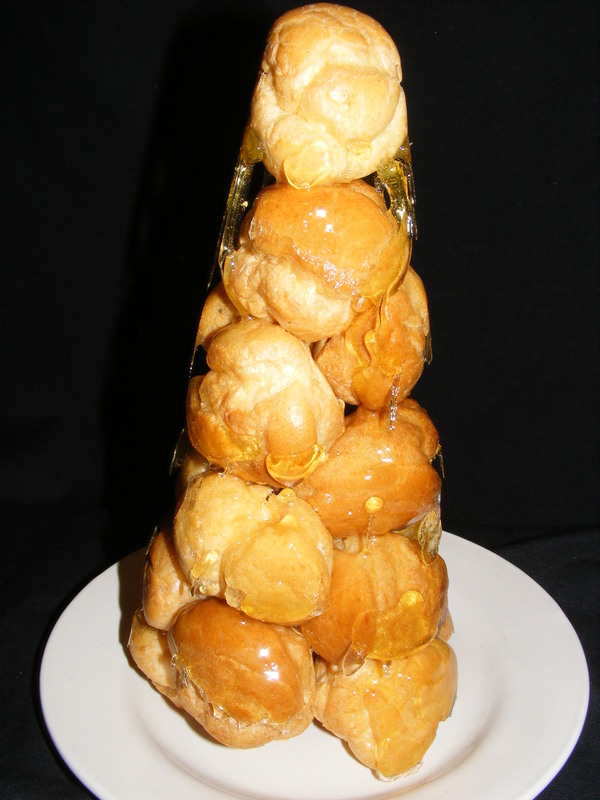 I made up the ingredienst as per the instructions for making a large croquembouche but actually only made a small one because there is only the two of us and the profiteroles keep well enough in an airtight container. Put the butter and water to be put in a pan, covered with clingfilm and bring to the boil. Remove the cling film with out getting second degree burns from the steam! Dump all the flour straight into the just boiled liquid and beat to a smooth paste. Spoon the mixture into a piping bag fitted with a plain 5mm diameter nozzle. 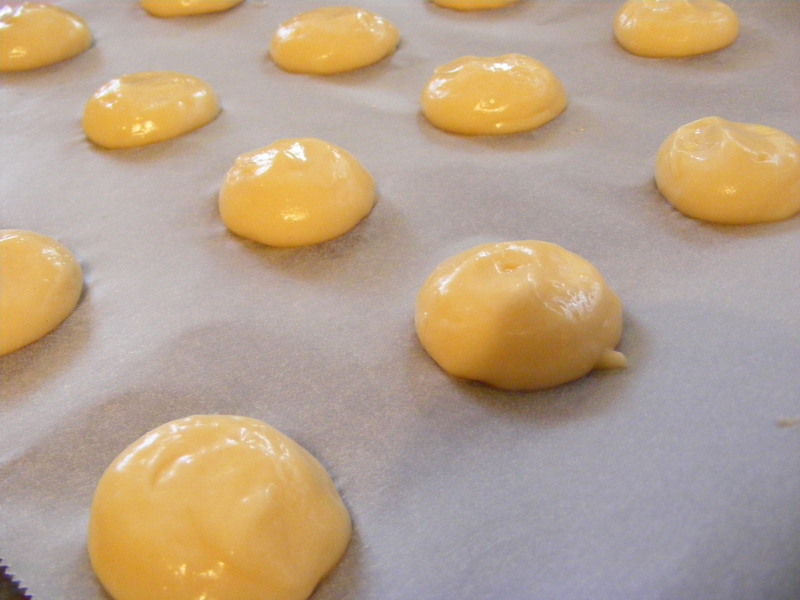 Pipe 5cm diameter blobs into the lined trays, allowing room for the profiteroles to spread. Use wet fingers to flatten an peaks in the pastry. Bake for 20 minutes until golden brown and well risen. Remove from the oven and pierce the bottom of each profiterole with a skewer to allow steam to escape (This prevents the pastry going soft). Return to the oven for a further 3 minutes the remove and allow to cool completely on a cooling rack. Plunge the pan into cold water to stop the sugar from continuing to cook from the residual heat in the pan. Make sure you do not alllow any water to get into the sugar as you will have to start again! Allow the sugar to set, at least 30 minutes, then carefully peel away the non-stick cone. Decorate with extra spun sugar if you desire. All in all this is a decent little set. I think the company need to work on the cone a little or give better instructions on how to construct it as I clearly had issues but at the end of the day I produced a croquembouche! 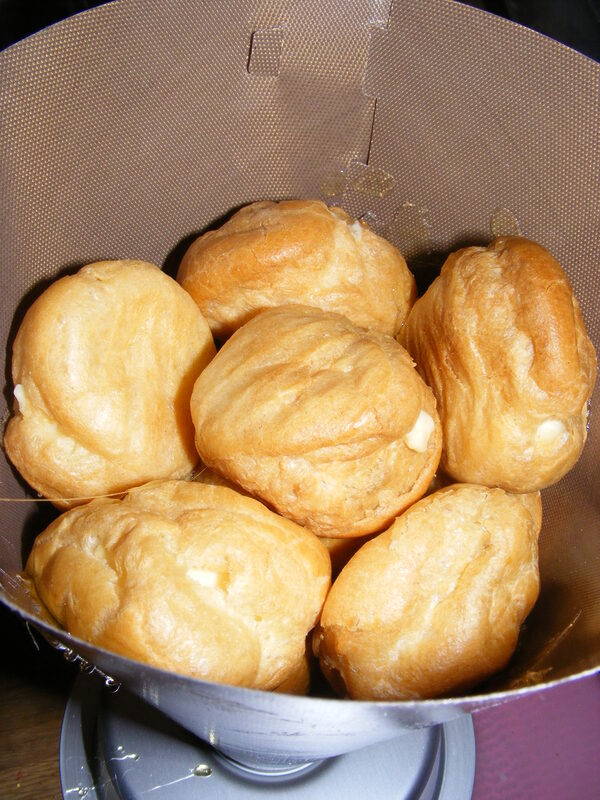 Plus I will be switching to this Choux recipe from now on because it was so easy!